(Bloomberg) – The South African state-owned power company’s warning that the country was threatened by months of rotating blackouts became a reality in less than 24 hours. Eskom Holdings SOC Ltd., which produces most of South Africa’s power, said on Wednesday that controlled blackouts could return and last throughout the year. Even more concerning is that the company expects energy availability of the system will keep declining into early next year and probably only recover to current levels in six months. By Thursday, Eskom announced it was cutting 1,000 megawatts from the grid. It doubled that amount on Friday in an outage that’s scheduled to last 13 hours. 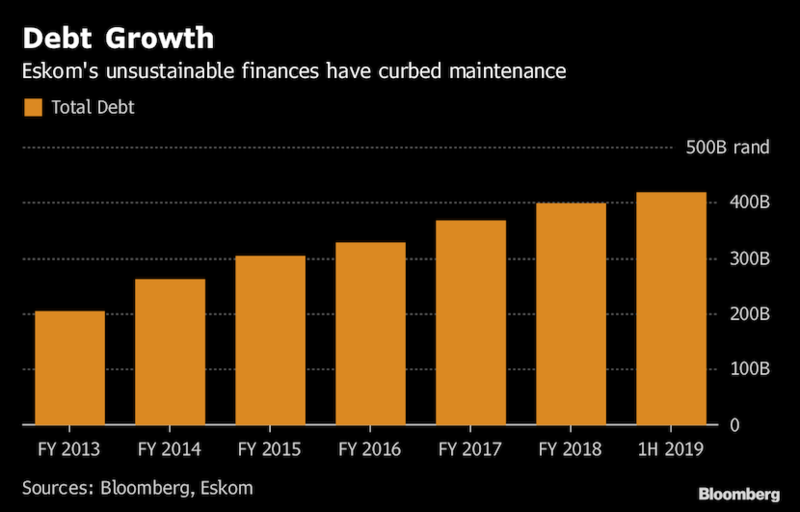 Eskom’s debt has soared to R419bn ($30.6bn), while sales volumes have dropped. Its generation difficulties are connected to the financial challenges, which limit the amount of maintenance and refurbishments the company can afford to carry out at its fleet of aging power stations. The utility is also running low on coal. New power stations being added to the grid, which were already behind schedule and over-budget, will now require an extra R1.5bn to work out final kinks, Chief Executive Officer Phakamani Hadebe said earlier this month. Power that Eskom imports from Mozambique’s Cahora Bassa hydropower plant has also been interrupted. Technical faults reduced that supply by 700 megawatts, but it is gradually ramping up again, said spokesman Khulu Phasiwe. While the company is discussing the turnaround plan with the government, Eskom faces a debt burden that’s “impossibly high,” Eskom Chairman Jabu Mabuza said on Thursday.